Welcome to our second Blog or Treat article! I wanted to do another scary monster during this week, and figured there was no reason think small. So in this post we’ll stat up Death. In the previous article we launched right into the stats of the Snake-Maned Lion, but here let’s look at the historical and narrative concepts around the Grim Reaper first. According to the ever-helpful Wikipedia, many cultures and mythologies describe different personifications of death. It’s not considered a bad thing in all of them, which results in the messenger of death looking more like an angel who merely takes the departed to the afterlife. However, the version we’re interested in is the black-robed skeleton with the scythe, an invention of 14th-century Europe. The name “Grim Reaper” is more recent, having been first recorded in 1847. The mention of “14th-century Europe” might ring a bell. Indeed, that’s when the Black Death swept through the continent. It’s not a stretch to think that the skeleton-and-scythe imagery comes from it. It’s as much a personification of the fear of death as it is of death itself. The Reaper does not symbolize death as part of a cycle, or a gentle passing into some higher realm. A scythe is not a tool for gently picking individual wheat stalks. No, the Grim Reaper is the Death that does to humanity what a farmer does to a field come harvest time. It’s the Death that takes away your loved ones in the prime of their lives and then comes for you. You have as much defense against it as wheat does against the farmer. The monster and its variants statted up below draw inspiration from this imagery, and from a couple of other similar creatures I’ve run across in other games. It’s appropriate for Dungeon Fantasy or horror campaigns, being a much scarier threat in the latter. Long thought just a legend or a metaphor for death, these beings turn out to be quite real. Most of what is known of them is pure speculation, as almost no one who got into a position to take a good look at them survived the encounter. Are they a form of spectral undead? A demon? Are they a species of monster, or is there just the one avatar of Death itself? It is known that Grim Reapers are floating figures wearing voluminous, tattered black robes and wielding large scythes. Beyond that, accounts vary. Some say they look skeletal, others see a demonic horned visage, and others report only darkness staring at them from beneath the hood. Some report it carring a lantern in addition to the scythe. One of the reasons it’s so hard to get a precise account of how their look is that these creatures inhabit a place between life and death. They are normally completely invisible to mortal eyes, and intangible to anything physical! They attack by reaching through this veil and pulling unwary mortals through. The closer they are to the reaper’s in-between home, the more than can interact with it… and once they are close enough, the monster cuts them down with its absurdly sharp scythe. No one has encountered more than one Grim Reaper at once… but they tend to hang out in places soaked in plague and/or evil, much like Snake-Maned Lions and other similar monsters, so it wouldn’t be implausible to encounter it alongside these other creatures. Pull Through the Veil (16): 1 point toxic, and the target becomes marked by the Reaper (see Notes, below). Reach C, 1. This is a Cosmic attack that ignores DR, and affects substantial targets. Grim Scythe (18): 3d+3 cut or 3d+1 imp or 1d+1 cut (Hook). Reach 1. Often done as a Deceptive Attack. This is a Cosmic attack that ignores DR! See Notes, below, for which targets are valid. Traits: Astral Entity (p. B263); Dark Vision (with Color Vision); Fragile (Unnatural); Flight (max Move 7); Enhanced Parry 2 (Scythe); Indomitable; Immunity to Mind Control; Injury Tolerance (No Blood, No Brain, No Vitals, Unliving); Skinny; Temperature Tolerance 10; Unfazeable; Vaccum Support. Notes: When a target first becomes marked by the Reaper, they begin perceiving their surroundings as blurry and colorless (-1 to Per-based rolls to make out detail). 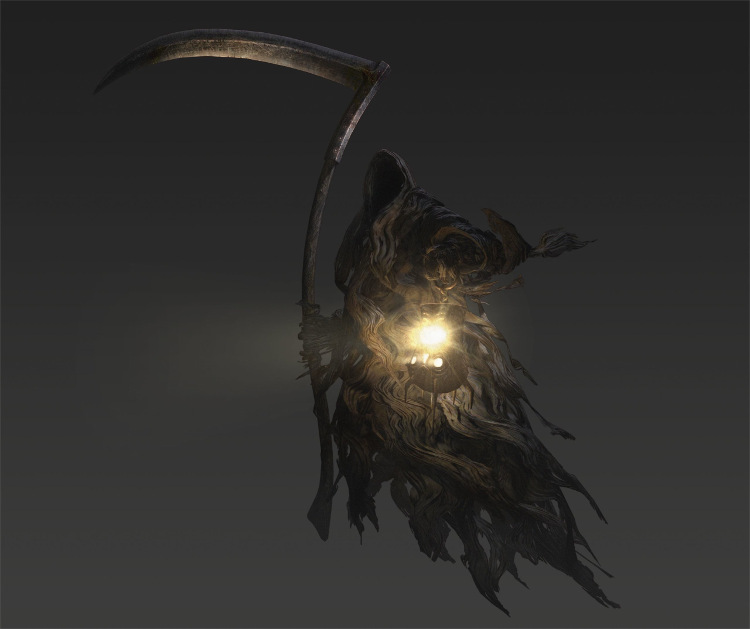 Characters who have been marked once can see the Reaper in full detail; they can attack it for half damage, and it can attack them for half damage as well. Twice-Marked characters can interact with the Reaper as if it was fully substantial and vice-versa. These marks fade after a minute, returning the character to normal. The scythe disappears when the creature is slain. The Reaper attacks by invisibly approaching the most vulnerable-looking party member, marking them twice, and cutting them down. Its touch grants it the ability to isolate vulnerable adventurers without having to rely on terrain, as it remains invisible and insubstantial to the victim’s friends. It makes free use of tactics such as Deceptive, Defensive, Committed or All-Out Attacks to exploit holes in its opponent’s defenses. To effectively fight a Reaper, the PCs should have access to magic that allows them to see and affect invisible and insubstantial creatures. Being undead, it’s also vulnerable to some Cleric and Holy Warrior powers. Lacking either of those, they might contrive to get marked by the monster and fight it that way, though that’s pretty risky as it’s a superb melee combatant. Its multiple injury tolerances and high HT mean it might only die when it hits -36 HP, and it’s smart enough to fly away and try again when the marks have worn off. Even a single Grim Reaper can pose a significant challenge to a whole delver party. Plenty of variance is possible here by changing the answers to the questions at the beginning of the monster’s description. Different Class: This variant is not undead, but is either a Demon or a Divine Servitor. This either makes it vulnerable to a different set of Holy powers, or not particularly vulnerable to any of them. Greater: This large variant carries an oversized scythe. It might well be the Grim Reaper! Change ST and HP to 27; change SM to +1; change scythe damage to 5d+5 cutting or 5d+2 imp or 3d-2 cutting (Hook); change scythe range to 1-2. Lantern-Bearing: This variant carries a skull-shaped lantern in addition to its scythe. The lantern can cast Mass Sleep at power 15 and has a 30-point Energy Reserve. Particularly cruel GMs can have the Mass Sleep be cast at power 20 instead. The lantern also disappears if the creature is slain. Materialized: While still a spirit, this variant exists closer to the world of the living than to the world of the dead. It’s visible and almost solid, but still difficult to hurt. Remove Astral Entity and the Pull Through the Veil attack and replace Injury Tolerance (Unliving) with Injury Tolerance (Diffuse). Incidentally, one of the inspirations for this monster is Dragon’s Dogma, which features a Greater, Materialized, Lantern-Bearing Grim Reaper in its most dangerous dungeon.